If you’ve got an ArcGIS/ArcFM dataset and you’re maintaining relationship(s) between devices and the structure that supports them, then we’re guessing you use the ArcFM “Structure Relate” auto-updater (AU) to do much of the work. It’s a pretty straightforward piece of logic in the core ArcFM solution. When you place a device – say a fuse or transformer or switch in an electric dataset, or overhead splice or slack loop in a fiber dataset — the AU performs a spatial query using a standard radius to find a thing designated as a structure. And yes, if multiple structures fall within the search tolerance of a new device feature the relationship will be established with the closest one – as we see at the right. If you want the relationship to be defined to the structure farther way, then simply use the attribute editor to make the update. 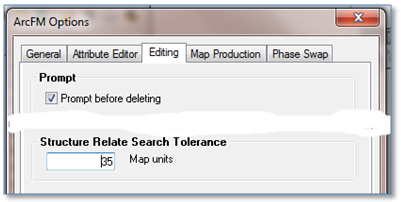 Now, when the structure relate AU fires the default search tolerance is 25 map units. 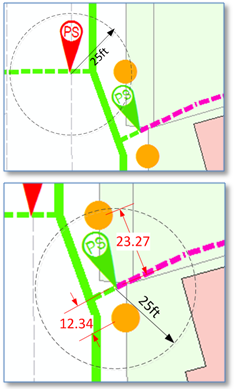 Which is fine if your mapping conventions call for devices to fall within 25 feet of a structure. What if they don’t? Then SE has provided an option under the “Editing” tab of the “ArcFM Options” dialog where you can change it! Here are a few more tidbits on the structure relate auto-updater which apply at least as of version 10.2.1a. The target structure class and associated device class must exist within the same feature dataset. To be able to assign the “ArcFM Structure Relate” auto-updater to a class there must be, 1) a feature class already present in the feature dataset with the class model name STRUCTURE, and 2) a relationship between the structure class and class to which your assigning the AU. The relationship typically has the cardinality of one-to-many. 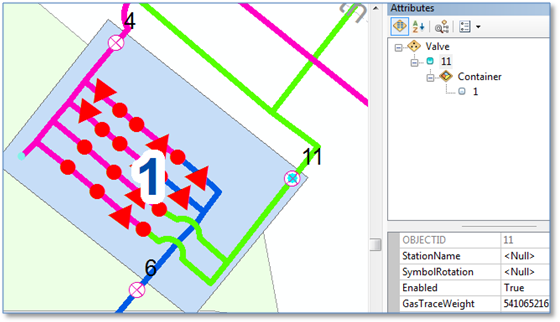 It does work with polygons as the target “structure.” Per the example below, say you assign the STRUCTURE model name to your gas regulator station polygon class and create a relationship from regulator station to valve, then creating a valve that falls within the station boundary will establish the relationship. © Copyright 2019 Blair Services. All rights reserved.